Oh, were these good! We had these at our cooking club last week. Our theme was local, so Gretchen used local peaches. This was such a treat! They aren't too hard to make either, such a perfect treat for summer. You could use any fruit you wanted actually, oh the possibilities! To make the dough combine the flour, salt, and butter in a food processor. Pulse until crumbly. You can use a pastry cutter or two knives if you don't have a food processor. Gradually pour the cold water in while pulsing until a dough ball forms. Wrap in plastic wrap and refrigerate for one hour. To make the filling, thinly slice the peaches. In a medium bow, toss peaches with the sugar and set aside. Preheat your oven to 350 degrees F. Line 2 baking trays with parchment paper. Prepare egg wash by mixing 1 egg and 3 tablespoons of milk. Set aside. Cut the dough into quarters and dust your surface with flour. Roll one piece at a time into 12 inch rounds that are approximately an eigth of an inch thick. Scoop a quarter of the filling into the middle of the dough and roughly fold up the sides of the dough, leaving some of the filling exposed. (Reserve leftover juice and sugar for drizzling.) Place on a baking sheet lined with parchment paper and brush with egg wash. Repeat with the other 3 dough balls. Bake for approximately 1 hour, until the filling is bubbling and the crust is golden brown. To make drizzle, put leftover juice and sugar from peaches in a small saucepan. Bring to a boil and reduce heat until mixture becomes thicker. 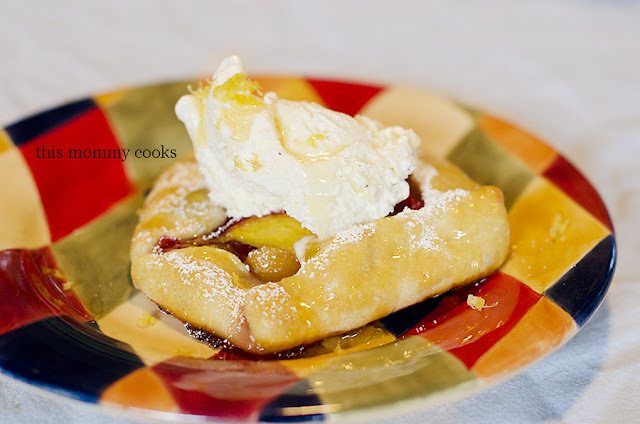 Once the galettes are cool sprinkle them with powdered sugar and drizzle with peach sauce. You can also top with ice cream and lemon zest like we did! Delish!